What’s in your garden? If you know where to look, you’ll see there are oodles of adventures for curious preschoolers. 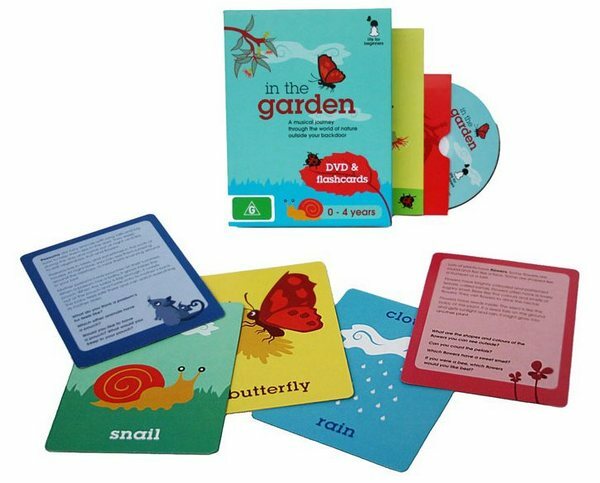 Start your backyard adventure with In the Garden, developed by Melbourne-based duo Sonia Orchard and Martine Corompt. Authors, media artists, environmental educators and mother’s group buddies, Corompt and Orchard combined their considerable talents to create a beautiful DVD and flashcard set. In the Garden is all about the animals and plants in the Australian backyard – it’s David Attenborough for toddlers. The DVD is simple and engaging – stylish animation combined with gentle music, appropriate sound effects and a deliberate absence of narration. Before you file In the Garden next to the various other moving image and music DVDs created for babies (and there are a lot of them), know that this is so much more. Apart from the fact that the graphics have a very distinct and appealing style, the content encourages interaction and flashcards extend the experience. I plonked my two ‘pre-school product testers’ in front of the DVD and then sat back and observed – I could barely hear the music over my kids’ narration, “Look! It’s a bee!… On the rose!… Now on that purple flower!” and so on for the duration of the DVD. The thing I like most about this set is that it very much reflects the average Aussie backyard – as much as I would like a carefully planned, landscaped masterpiece, our backyard instead has roses next to banksias, dandelions invading the lawn and some territorial maggies. In the Garden features wattle birds, parrots, possums and moths as well as lavender, eucalypts and apple trees. Most importantly, the content is clever. Children will relate to what they see and more complex topics, such as how dandelion seeds spread, the life cycle of a caterpillar and basic food chains, are simply animated and very well presented. Supporting the DVD is a set of sturdy flashcards. Again, I’m loathe to use the word ‘flashcards’ in case you think they are ordinary. Instead, each card features a picture on one side and a little information and a few well-pitched questions on the other. Read them, commit a couple of questions to memory and head out with your preschooler for a backyard adventure. In the Garden is $35 and available directly from Life for Beginners and selected stockists.